We will take a snapshot look at example explosions and fires involving chemicals including fuels. Many of the examples chosen occurred at U.S. industrial facilities. Major accidents at these locations are investigated by governmental agencies such as the Chemical Safety Board, the Department of Transportation, Occupational Safety and Health Administration, and the Environmental Protection Agency, and their reports are published and available in the public domain. Other investigations are done by insurance companies. Similar investigations are done by appropriate governmental agencies in several other countries, and the reports are sometimes available. Several of these events are vapor cloud explosions. 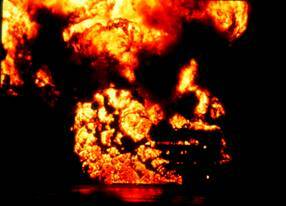 Some involve tank or vessel explosions and some examples are cascading chain-event accidents. Both catastrophic and smaller scale examples are illustrated. On the afternoon of 1 June 1974 at an industrial facility manufacturing a nylon precursor chemical, a 20-inch diameter pipe carrying cyclohexane at 150oC (302oF) temperature and 1 MPa (145 psi) pressure ruptured (possibly the result of a pressure surge) sending a large amount of vaporized cyclohexane into the atmosphere. At this temperature and pressure, the cyclohexane would have been liquefied, but would have flashed almost instantaneously with the pressure released. The vapor cloud according to reports (see http://chemicalprocesssafety.org/flixborough.aspx) was estimated to be 100 to 200 meters (320 to 650 feet) in diameter. The vapor cloud found a nearby ignition source, possibly a furnace at a nearby hydrogen production plant, and exploded resulting in a fireball. The blast completely destroyed or severely damaged 1800 buildings within a mile radius from the site; secondary fires burned for over a week. All 18 employees in a nearby control room were killed; 9 other site personnel were also killed, plus 2 other people counting a heart attack victim in a vehicle. There were 36 people seriously injured. Fortunately, the accident occurred on a weekend when almost all employees were away. The TNT equivalent of the fuel-air mixture was estimated to be 15 metric tons based on blast damage (which is a greater TNT equivalent than what would be calculated based on a yield factor of 0.06 listed in the ARCHIE manual and one estimate of 40 metric tons of cyclohexane in the vapor cloud). The blast resulted in significant structural damage to buildings in the town of Scunthorpe, 3 miles away, and was heard 25 miles away. On 23 October 1989, at about 1 PM, a vapor cloud explosion and fireball occurred at the Phillips 66 Company polyethylene production plant near Pasadena, Texas, killing 23 workers, one worker missing, and injuring more than 130 others (one account said 314 people injured). The accident was investigated by Occupational Safety and Health Administration, the Environmental Protection Agency and other agencies; the OSHA report is available at http://ncsp.tamu.edu/reports/phillips/first%20part.pdf and a book on the incident is available through http://catalogue.nla.gov.au/Record/4183313?&#details. The vapor cloud resulted as a sudden gas release of an estimated 85,000 lbs of a flammable gas mixture through an 8-inch open valve; the gas was a mixture of hydrogen, ethylene, hexane, and isobutylene. The accident apparently occurred when operators were trying to remove solidified polyethylene from the system. The vapor cloud (estimated to be roughly 1100 feet long, 800 feet wide, and 5 feet high) drifted downwind for about 90 to 120 seconds (another account said 5 minutes) before contacting an ignition source. The wind was from the south at 10 to 16 mph. The vapor cloud plus additional flammable gas inside tanks at the valve source exploded with a force equivalent to 2.4 tons of TNT based on blast damage. Two isobutene storage tanks exploded 10 to 15 minutes later. 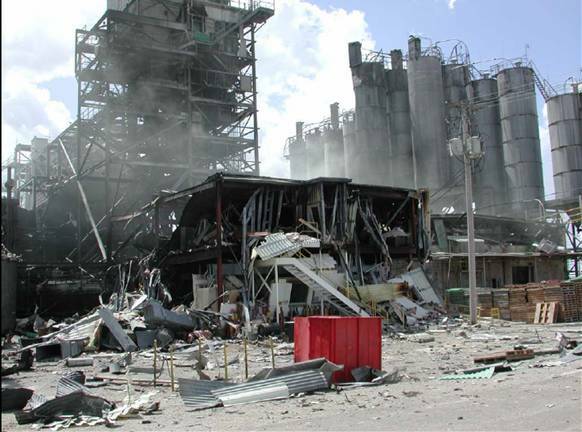 A third explosion occurred 15 to 30 minutes later when a polyethylene plant reactor failed catastrophically. The two polyethylene production plants covering 16 acres near the source of the blast were destroyed. Windows were shattered and bricks were ripped out in an administration building 0.5 miles away. Fragments were thrown as far as six miles away. The OSHA investigation uncovered a number of deficiencies resulting in fines against the petrochemical company and its operating contractor. Usually if a natural gas explosion levels a home, the cause may be a defective furnace or stove or other leak inside the house. Odorants (small amounts of sulfur-containing hydrocarbons giving a rotten egg odor) are purposely added to warn homeowners of the leak. But sometimes a natural gas explosion occurs without warning, and no odor was detected by neighbors or by a postal worker at the home 30 minutes before the explosion. 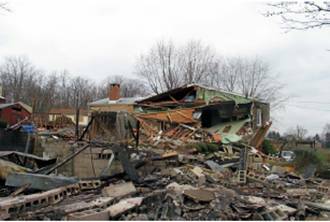 On 5 March 2008, shortly after 1 PM, an explosion leveled this Pennsylvania home killing one man inside and seriously injuring a 4-year-old girl. Two other houses were destroyed and 11 houses were seriously damaged. The mysterious accident was investigated by the National Transportation Safety Board (report http://www.ntsb.gov/publictn/2008/PAB0801.pdf). The cause of the explosion was a corroded and cracked 2-inch natural gas pipeline, at 10 psig, which failed resulting in natural gas entering the home via a porous backfill for a nearby sewer line from the house. All this occurred underground with no advanced warning. Apparently the home filled quickly with natural gas as no one in the neighborhood noticed the natural gas odorant. The concentration of natural gas reached the lower explosive limit, the gas found an ignition source, and the house exploded. The report concluded excavation 5 years earlier for a sewer line likely damaged the protective coating of the pipeline allowing corrosion and eventual pipe failure to occur. The pipeline itself was not affected by the house explosion. On 3 December 2004, a tank flash fire and explosion occurred at a processing facility operated by Marcus Oil and Chemical on the southwest side of Houston. 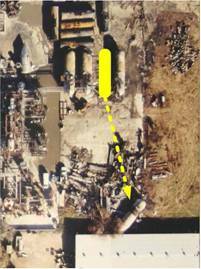 The horizontal tank itself (12 foot in diameter and 50 foot long) was propelled 150 feet where it impacted a warehouse (see yellow arrow at left). The tank was part of a polyethylene wax processing operation, and normally operated at 300oF and under a mostly nitrogen atmosphere at about 45 psig. Later investigation by the U.S. Chemical Safety Board (CSB) showed that that tank likely failed due to a defective weld at a tank patch plate at possibly 69 psig, and that the nitrogen generator used to pressurize the system contained as much as 18% oxygen. A fire resulted which burned for 7 hours. The blast caused structural damage and glass breakage up to 0.25 miles away. A 120 pound steel plate was found in a pasture 900 feet away. 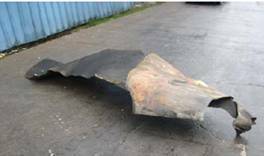 A 2-pound steel plate was found in the yard of a resident ¼ mile away. The full report is available at http://www.csb.gov/completed_investigations/docs/CSBMarcusOilCaseStudy.pdf. Normally, the wax-like material inside the tank was not considered flammable but is combustible. 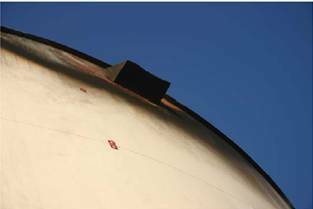 The CBS report concluded that at about 69 psig, the defective weld failed severing a tank patch plate from the tank. When the patch plate struck the concrete pad, sparks were generated which ignited the wax and hydrocarbon vapors coming from the tank. The flame flashed back into the tank. An internal deflagration blew the vessel head into multiple fragments. On 12 January 2009, at the Silver Eagle Refinery, Woods Cross, Utah, flammable vapors were released from the tank vent at left while the tank was being filled with light naphtha under atmospheric pressure. The resulting vapor cloud found an ignition source, resulting in an ensuing flash fire 230 feet long. Two refinery operators and two contractors suffered serious burns. The tank contents, which contained an estimated 440,000 gallons of naphtha, did not catch fire. 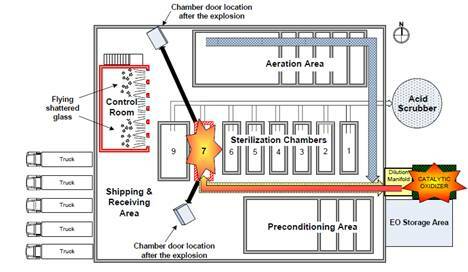 On 19 August 2004, an explosion took place inside an air pollution control device and medical products sterilization chamber at a company in Ontario, California, injuring 4 workers and severely damaging the facility. Ethylene oxide is used as the sterilization chemical for the medical products; the chemical is both highly flammable and toxic (boiling point 51oF, Lower Explosive Limit 2.6%, Upper Explosive Limit 100%, Flash point -20oG, OSHA 8-hour permissible exposure limit 1 ppm). The Chemical Safety and Hazard Board (CSB) Report is available at http://www.csb.gov/completed_investigations/docs/CSBSterigenicsFinalReport.pdf. Normal sterilization procedure is to first subject the medical products contained in their normal packaging to high humidity and warm (80o to 120oF) temperatures for 6 to 24 hours (depending upon the product), followed by injecting gaseous ethylene oxide into specially-designed chambers containing the products. Under these conditions, the ethylene oxide penetrates the packaging to sterilize the medical products. When the sterilization is complete, the chamber is evacuated followed by a series of nitrogen and/or nitrogen-air flushes to reduce the concentration of ethylene oxide to well below the lower explosive limit; the exhaust gas containing ethylene oxide is routed to a scrubber. Additional air flushes are done to decrease the ethylene oxide concentration in the chamber to below toxic levels before workers can enter the chamber to remove the sterilized medical products. The final air venting (containing small amounts of residual ethylene oxide) passes through a catalytic oxidizer before exhausting to the outside. However, on the day of the explosion, during a system troubleshooting checkout with no medical products in the chamber, operators bypassed some of the flushing steps to save time (a bad decision). 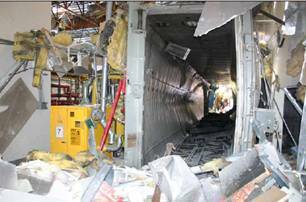 Furthermore, chamber had no monitoring or detection equipment to warn operators that an explosive mixture of ethylene oxide remained in the chamber when the chamber door was opened. This caused an estimated 50 lbs of ethylene oxide to vent to the catalytic oxidizer and also into the building setting off nearby LEL alarms. The ethylene oxide ignited in the catalytic oxidizer causing the flame to flash back to the chamber resulting in a powerful explosion. Fortunately, there were no employees in the chamber area at the time of the explosion. BP Refinery Explosion and Fire, Texas City, Texas, 2005, 15 killed, 180 injured. On 23 March 2005, the worst U.S. workplace accident in 16 years occurred at the BP Texas City refinery when flammable vapors from a blow down vent formed a vapor cloud and ignited, apparently from an idling diesel pickup located about 25 feet away. The resulting explosion and fire killed 15 workers and injured 180. The accident occurred during startup of the refinery’s octane-boosting isomerization unit (boosts octane content of gasoline), when a distillation tower and attached blowdown drum were overfilled with highly flammable liquid hydrocarbons (the major part of gasoline). Because the blowdown drum was vented to the atmosphere, there was a geyser-like release of flammable liquid and vapor onto the grounds nearby causing a series of explosions and fires that killed 15 workers in and around nearby trailers. Houses were damaged up to ¾ miles away from the site. The blast was felt up to 5 miles away. A shelter-in-place order was issued that required 45,000 people to remain indoors. 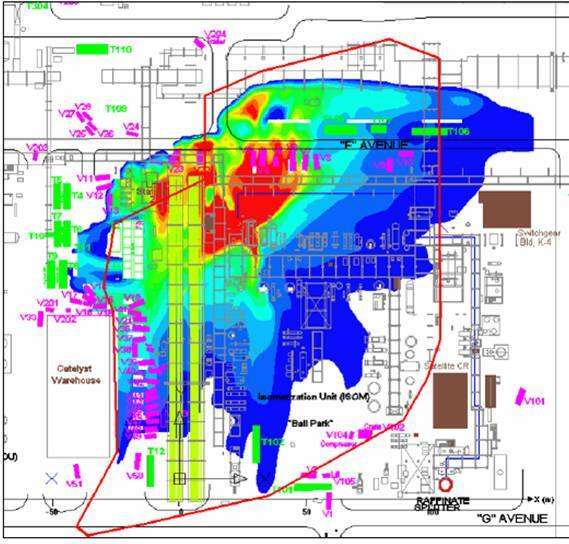 Blast overpressure map, based on site observations, structural analysis, and blast modeling. Over pressure circles at 10+, 5+, and 2.5+ psi; also 2.0, 1.0 (320 feet from center) 0.5 (540 feet), and 0.25 psi (940 feet). The 0.1 psi overpressure line (not shown) occurred at about 2000 ft. from the center, consistent with observations of furthest identifiable glass damage. Unfortunately, the CSB did not provide a scale for the map so these are our estimates based on text statements in the report. Estimated Vapor Cloud location. Field observations (red line), dispersion modeling (solid colors). From CSB report. Unfortunately, the CSB did not provide a distance scale for the sketch. The CSB report estimated that as much as 6730 gallons of hydrocarbons was released to the outside as a vapor cloud and liquid which pooled before the explosion and additional 855 gallons after the explosion. The hydrocarbon mixture was 30.7% n-heptane, 29.5% iso-hexane, 15.2% n-hexane, 13% n-octane, 4.1% n-nonane, 1.4% n-decane, 3.8% n-pentane, and 2.6% iso-pentane. The CSB modeled the vapor cloud using a class A stability and 80oF temperature. Based on explosion damage distance observations, our modeling using the PEAC tool suggested that considerably less than 6730 gallons participated in the explosion based on a TNT yield factor of 0.03; the rest formed a liquid pool and a vapor flash fire (deflagration). 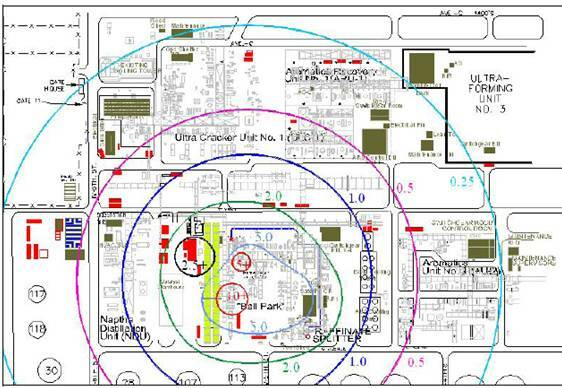 The liquid pool was noted in the CSB report, which estimated the pool radius increased to 27 meters at 106 seconds after the release, the time of the blast. The burned area was 200,000 square feet. Image from CSB Report available at http://www.csb.gov/completed_investigations/docs/Final%20_Amended%20030907%20rpm-b.pdf. 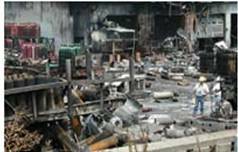 On 23 April 2004, an explosion and fire occurred at a polyvinyl chloride (PCV) manufacturing facility killing five and injuring three employees. The resulting fire spread to PVC resins stored in a nearby warehouse, resulting in smoke drifting over the nearby community of Illiopolis, Illinois. The community within one mile of the site evacuated for two days. The facility was shut down and not rebuilt. Vinyl chloride monomer is used in the manufacture of PCV. The chemical has a boiling point of 7oF (-14oC), a lower explosive limit of 3.6%, toxic (OSHA 8-hr permissible exposure limit of 1 ppm, and a potential occupational carcinogen. The CSB report determined that the explosion occurred when an operator drained a full and pressurized PVC reactor. Another operator cleaning a nearby reactor apparently opened the bottom valve of an operating releasing approximately 15000 lbs vinyl chloride monomer, PVC, and other ingredients. The two operators and the shift supervisor attempted to manage the release and did not evacuate and subsequently died when the released vinyl chloride contacted an ignition source. Two other workers were also killed, including one who died in the hospital two weeks later. The root cause was confusion on the part of an operator or operators as to which valve to open, and that the interlock protection for the bottom valve had been bypassed. The company had an emergency transfer procedure to transfer reactor contents to another reactor in case of excessive pressure buildup in a reactor which required them to open the bottom valves and transfer valves to connect the reactor to another reactor, but the tank contents were released to the room. According to accounts, there were several explosions as the fire contacted other tanks. All photos and information from the Chemical Safety Board website at http://www.chemsafety.gov/index.cfm?folder=completed_investigations&page=info&INV_ID=59. At left is the facility after fire engulfed thousands of cylinders of propylene, propane, acetylene, and other flammable gases. During the fire, exploding gas cylinders or cylinder parts were launched into the community. Security camera view, One cylinder catches fire (upper left), 3:20 PM, the start of the incident. 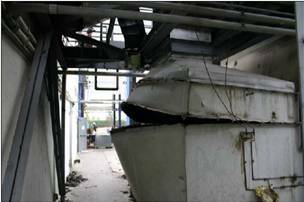 According to the CSB Safety Bulletin (available at CSB website), the likely root cause was a combination of hot ambient temperature and direct sunlight heating which caused one of the partially-filled propylene cylinder internal pressure to build up. The safety release valve on the cylinder opened and vented the propylene. The vented propylene gas found an ignition source (probably static electricity) and caught fire. The fire heated an adjacent cylinder causing it to vent propylene which also caught fire. A domino effect occurred, eventually affecting about 8000 cylinders. The safety release valve on the initial cylinder may have been set to vent at too low a pressure as the gas cylinders were designed to withstand much greater pressures than what would normally be produced in a cylinder sitting in the hot sun. The normal minimum relief setpoint for propylene cylinders is 390 psig, which corresponds to a temperature of 149oF. On a very hot day with cylinders sitting out in the sun, temperatures could exceed maybe 130 or 140oF, which could result in venting if the relief setpoint is too low. 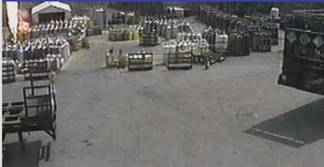 The CSB investigation also noted that this type of accident has occurred before at other locations, where propylene cylinders caught fire and rocketed causing damage to the facility and surrounding community, all occurring on hot days. The government organization put together a safety training video on this hazard which can be viewed at http://www.chemsafety.gov/index.cfm?folder=completed_investigations&page=info&INV_ID=59#. Complicating the issue was that some of the acetylene cylinders may have contained asbestos which may have been in the toxic plume cloud. Older acetylene cylinders are filled with a porous material containing asbestos. Noxious smoke and fumes from the fire resulted in a plume cloud over 1/3 mile wide and 1 mile long, and was attributed by the St. Louis Chief Medical Examiner to cause an asthma attack resulting in death of one resident. Following the incident, the company contracted a cleanup of the asbestos which the Missouri Department of Natural Resources monitored. The above photos, taken from the CSB report show the impact on the community. Fragments were found as far as 800 feet away. Employees evacuated the facility within minutes, as cylinders began exploding and flying into other parts of the facility at two minutes after the start of the fire. The St. Louis Fire Department arrived on scene at about 3:35 PM, 15 minutes after the start of the fire. Firefighters evacuated local residents, directed a water stream on the fire, and extinguished secondary fires started by cylinders propelled off site. The quick evacuation undoubtedly saved lives. The fire was under control at about 8:30 PM. While not mentioned in the CSB reports, the St. Louis Fire Department took a great deal of risk in this situation while fighting fires and evacuating people to a safe distance as exploding cylinders rocketed in all directions. 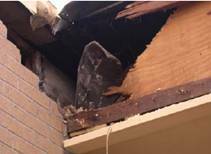 No one was injured by flying debris. The examples illustrated show the complexity of real-world fire and explosion events. The PEAC tool is designed to strip away the complexity and allow responders to examine the bare essentials. What are the hazards? What harm can the chemicals potentially do? How far should people be evacuated? The PEAC tool allows the user to rapidly examine a lot of “what if” situations. The emergency responder often does not know what the situation is at hand and can run through several “worst case” scenarios in the PEAC tool, and estimate a safe evacuation distance. Similarly, an outside inspector can do a “walk through” at an industrial facility and look at potential “worst case” releases or accident situations depending upon what he/she sees. Where are control rooms or other buildings housing people located with respect to places where a potential vapor cloud of a flammable gas can occur?. What are the best places to site sprinkler and deluge systems, gas detection alarms, and other safety devices? The PEAC tool can be used as a rapid first assessment to be followed by more detailed technical analysis specific of the site under evaluation.